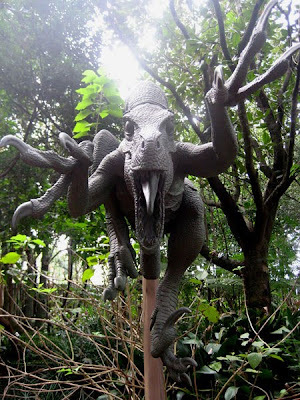 Yes, this velociraptor has been happily on the loose since Opening Day, roaming around an enchanting little garden, just waiting for some unsuspecting tourist to pass by, and then BOOM! He pounces! The only problem is, unsuspecting tourists do not pass by, leaving him perpetually in mid-pounce. 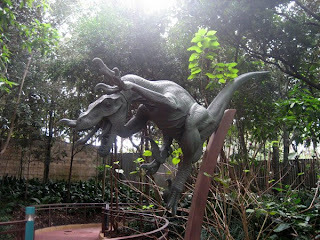 It was his unfortunate duty to be assigned to a section of overflow queue for Countdown to Extinction. As we all know, Countdown to Extinction was considered too obvious a title, so Disney changed it to the more mysterious and inscrutable Dinosaur: The Ride (About Dinosaurs). 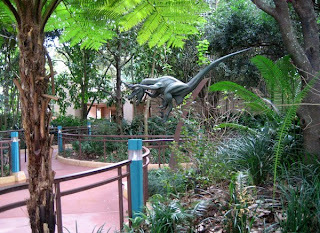 However, everyone forgot all about this little Garden of Carnivorous Delights, and I prefer to still think of this area as Countdown to Extinction’s queue, since to my knowledge, it has never been used as a queue for Dinosaur: The Ride (About Dinosaurs). Come to think of it, I have never heard of it being used as a queue for Countdown to Extinction either, though it was obviously planned as such. For whatever reason, the expected crowds have never materialized to warrant opening this section for business. It’s off to the right of the FastPass Distribution area, a happy little round-about with a toothsome reptile just waiting to be discovered. He still dreams of the crowds that could have been his, if only Disney hadn’t renamed their big E-ticket ride after a box office bomb. through the foliage to the left of the dino. Never had the pleasure of walking back there…neat info. Thanks!